The thermal cover is visibly discolored along its edge, gradually pronounced towards the outermost edge. I'm not sure if this is some sort of oxidation, chemical burn of thermal insulation materials as the airlock gases escape, discoloration of some materials due to exposure to the Sun as it remains open during the EVAs, or something else? Reflecting on his experience as he emerged from the craft into the daylight on the Expedition 24 mission's second spacewalk, astronaut Doug Wheelock said "the colors of the Earth just explode at you as you exit toward the planet. Notice what looks like scorch marks on the hatch thermal cover, the effect of vacuum and atomic oxygen on the threads and thread sealant used on the thermal cover. The 'smell' of space follows suit, I’ve heard it described like burnt cake or cookies, or like the smell of an extinguished match." 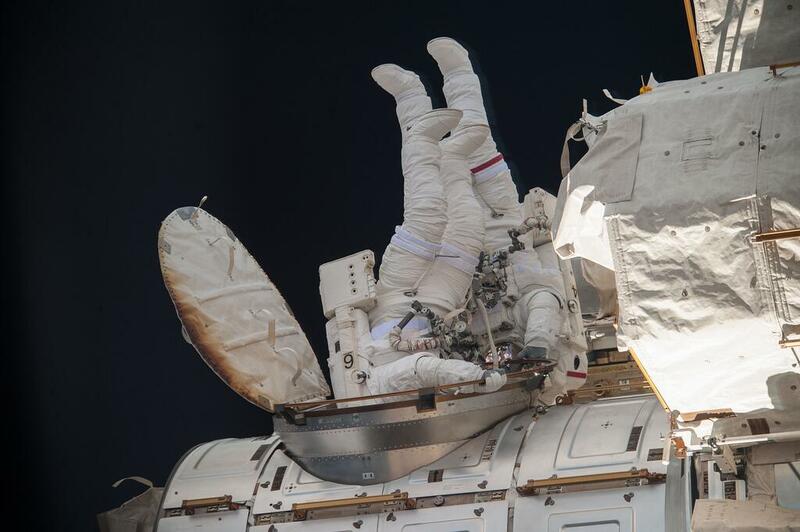 Wheelock and fellow astronaut Tracy Caldwell Dyson completed the second of three spacewalks to remove a failed ammonia coolant pump module on the station's S1 truss on Wednesday, Aug. 11. 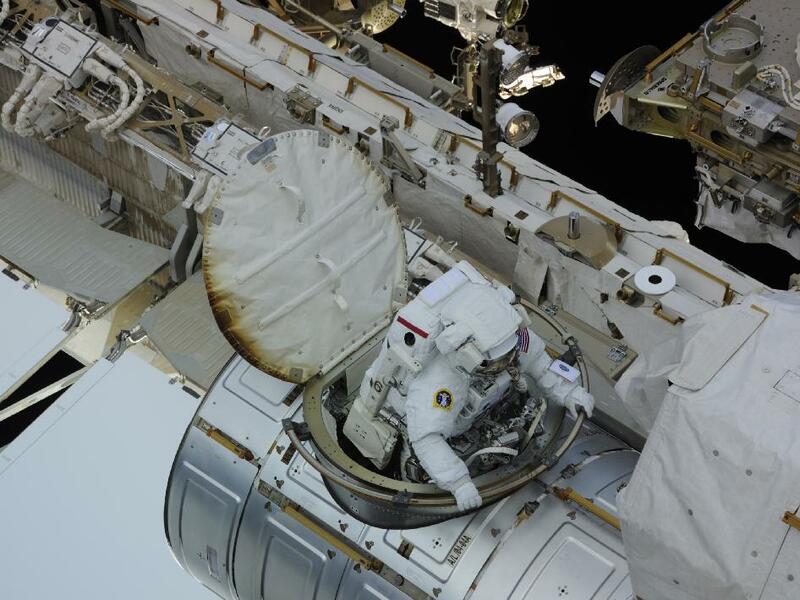 The more pronounced oxidation is on the Space Station's ram-facing side of the thermal cover, where interaction with the atmosphere is the greatest. Kudos to Mark Adler for this explanation! Not the answer you're looking for? 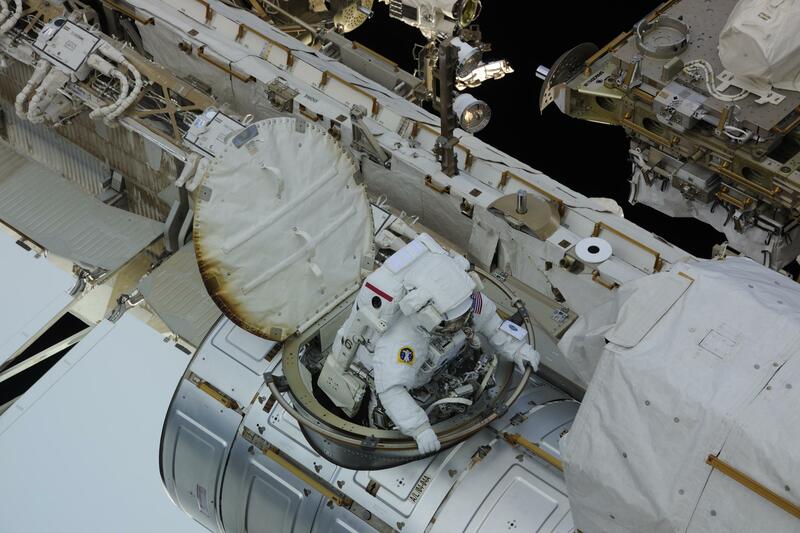 Browse other questions tagged iss materials eva thermal quest-joint-airlock or ask your own question. Would unpainted iron or steel rust in space? What is the airlock on Rassvet meant for? What are joint systems used for mounting manipulators to spacecrafts?